Travel day went as smoothy as a travel day can go. Schipol was friendly and easy to navigate, as always, and it didn’t take long to figure out the various bus and subway transfers to make it to my hotel. I’m staying just outside the “historic center” of Milan. 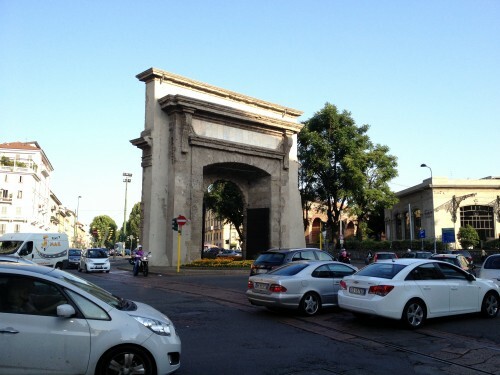 As in, I’m on the outside of the Roman Gate. When the Italians say “historic center,” they mean it. My approach to a new city is pretty simple. After dumping my bags at the hotel, I pick a direction and start walking. Stop, as appropriate for food and coffee, but do not stop to look at a map. Remember, with an iPhone, you’re never really lost. It’s a great way to get a sense for the pace of a city, the general vibe, the layout of shops, and so on. Early indications are that Milan is a very walking-friendly city. I made it across the center pretty quickly, then sort of deviated onto a ring road. As expected, it’s a much more modern, urban and business-focused city than Florence, but nowhere near as obnoxious as Rome. So far, I’m digging it. I’m not one for capital-s Shopping, but strolling past shop after shop of amazing clothing and accessories on one of the many pedestrian-only streets makes expensive splurges pretty tempting. The store that only sells handmade leather driving shoes was tough to resist. Most exciting car sighted so far? 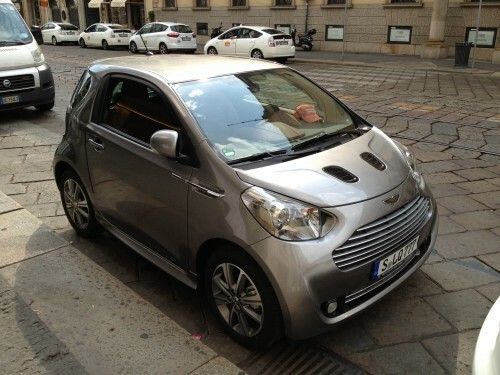 A bloody Aston Martin Cygnet! Apparently someone bought one!